Snake and Mongoose Metal Sign. The relationship between Funny Car drivers and partners Don 'the Snake' Prudhomme and Tom 'the Mongoose' McEwen is a riveting chapter in NHRA history and this September, drag racing fans will be in for a treat as the highly anticipated film, Snake and Moongoose-the Motion Picture, debuts in theaters nationwide. 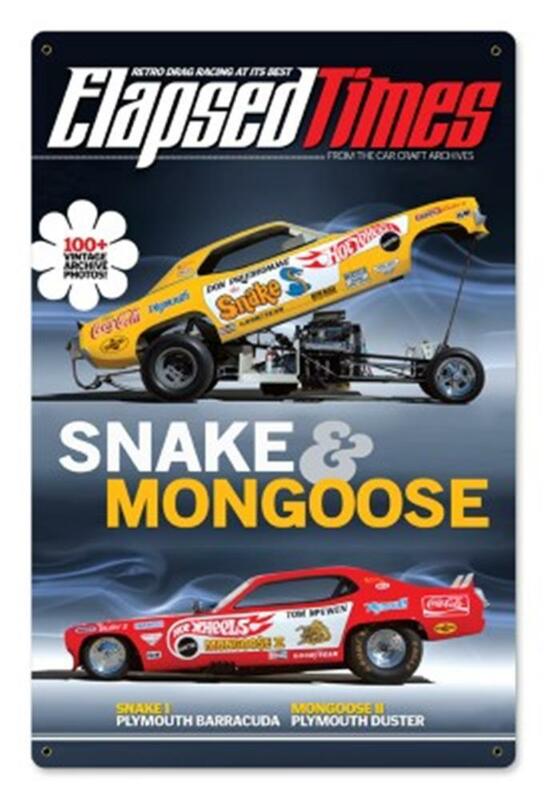 This durable, handmade 24 gauge steel sign is 12" x 18" with a powdercoated magazine cover image of the Snake and Mongoose Funny Cars. Pre-drilled and riveted. Made in the USA.